In a statement following the terrorist attack in Berlin on Monday Trump said that "terrorists and their regional and worldwide networks must be eradicated from the face of the Earth"
MOSCOW, December 20. /TASS/. US President-elect Donald Trump’s calls for international cooperation in the struggle against terrorism are consonant with what Russian President Vladimir Putin has been saying for years, presidential spokesman Dmitry Peskov told the media on Tuesday. "This is consonant with what President Putin has been saying for years. For the past sixteen or seventeen years Putin has been urging international cooperation in the struggle against this most dangerous challenge of our century," Peskov said. He pointed out that no country, even the strongest one, will be able to effectively fight against terrorism. "That can be done only together," he said. 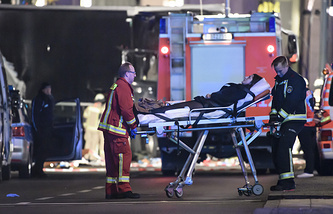 In a statement following the terrorist attack in Berlin on Monday, when a truck rammed into a crowd at a Christmas market fair Trump said that "terrorists and their regional and worldwide networks must be eradicated from the face of the Earth, a mission we will carry out with all freedom-loving partners." And on his Twitter page Trump linked the Berlin attack with the shooting incident in Switzerland and the killing of Russia’s ambassador in Ankara. "It is only getting worse. The civilized world must change thinking!" he wrote.